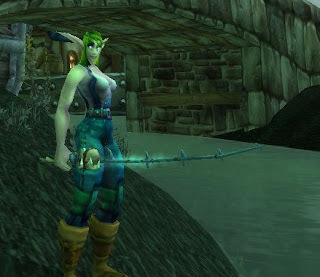 Azerothian Vignettes: Blog Azeroth Shared Topic: Rats and Turtles and Pinchy, Oh My! Blog Azeroth Shared Topic: Rats and Turtles and Pinchy, Oh My! Fishing is an odd sort of minigame in WoW and people I've talked to either love it or hate it. So what's your take on the most grindy of sports? If you love it: Why? Where's your favorite spot to go drop a line and veg while waiting for a strike? There's nothing like fishing. Pulling on my waders and relaxing in the great outdoors, listening to the water lap against the shore, waiting for the excitement of that first nibble. I think part of the reason I enjoy fishing so much is because it gives me a chance to unwind from the battles of the day. This is the same reason I like picking herbs and archaeological digs. The one thing I dislike most about fishing is the bait. I hate spearing poor wriggling worms onto the hook. That's why I was so excited to find a Bone Fishing Pole in a Bag of Shiny Things. It may be a little creepy using a rod made of bones, but it comes with an unlimited supply of phantom worms pre-hooked. The fish seem to like it just as well as real bait, maybe even better. Another one of the other reasons I enjoy fishing so much is because I love to eat fish, all kinds of fish. I'd go so far as to say it is my favorite kind of food, from Bristlewhisker Catfish to Golden Fishsticks. I like it all. Mmmm... On that note, I'm off fishing. I'm hungry! YOu and Toki both mention the bone fishing rid and I never knew about it before know, but if it comes with wriggly worms already I am sold!! Must do some more dailies! Glad I could share this with you. I hadn't known about it either until there it was in my bag. Allerian Stronghold in Terrokar has long been one of my favorite fishing spots in Outlands. Thanks for stopping by.